Five years ago, in a National Interest headlined ‘Them Versus Them’, I had traced a unique new faultline within India’s dominant elites for public debate: The governing classes versus the ruling classes. The governing elites are the politicians and bureaucrats, judiciary, conventional intelligentsia and journalists, police and armed forces brass. The ruling elites are the economically-arrived Indians outside the formal establishment: The corporates, new professionals, especially from IT and banking/finance, offspring of earlier generations of governing elites, and foundation-funded activists. The point was that the traditional elites and the new ones had so little in common, they were like two sovereign republics, suspicious and hostile of each other. That is why we called the phenomenon ‘Them versus Them’. Over these five years of further 7 per cent-plus growth, and the polarising reign of Narendra Modi, we have moved on from that relatively simple equation. The two elites stay distant, but have changed. The former “them” has worked hard at de-eliticising itself. Politicians and bureaucrats now live a lot more modestly, are petrified of being seen at five-star hotels, attending snazzy parties, or serving alcohol or fancy food at theirs. This Modi-era establishment draws power from the street more than the rule-book. The second elite has seen changes too. 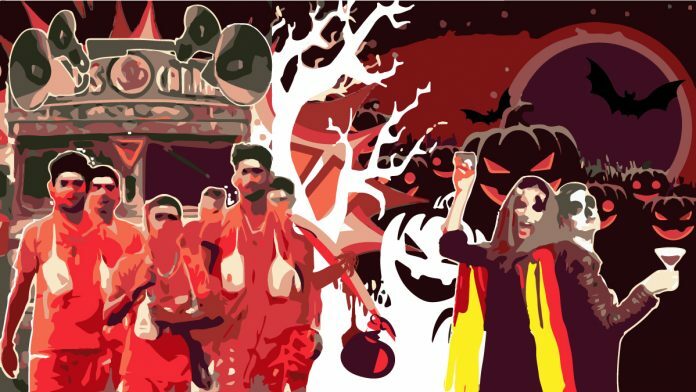 Because it predominantly feels alienated with the style and temper of the Modi-BJP government it considers crude, uncultured, illiberal, even Hindi-speaking “dehati”, it has gone deeper into its protected battlements. Both have seen defections: The corporates have defected away from the ruling class, and the top judiciary has walked in. Another addition is of an emerging new breed: The journalist-activist. A fair exchange you might say. As this argument unfolds, you will find that it isn’t as pat as it sounds. It has qualifications and nuances. Except, as they say in the American media these days, when you are explaining nuance, you are losing the argument already. Let’s, therefore, forget nuance for a moment and find a name for this twist to the ‘them versus them’ phenomenon that you can most likely remember. Let’s call it a tussle between kanwaria and Halloween classes. Kanwarias are the millions of Shiv Bhakts you see walking to Haridwar every year at monsoon time, to collect holy water from the Ganga. And Halloween is, of course, the American festival of “trick-or-treat”, which the upper crust is now taking to, both as a symbol of class, as well as a “clean” festival. Just compare it to the messy ones “they” have — the noisy, smoky Diwali, riotous Holi, river and ocean-polluting pujas, bloody Bakr-Eid and so on. I mean, just how can you ever civilise these kanwaria types? The concerns of our two original combatants were broadly similar, but the approach to resolve these was contrary. One believed in itself, the government; the other, to hell with the government, and to be left to its own resources and devices: Private diesel gensets, borewells, private security, schools, hospitals, airlines and cars. But both, to illustrate simply, had no stake left in government hospitals, schools, railways and public transport. Now, by Modi’s fifth year, the government system is more populist, more directly communicative to its constituency in the middle- and under-classes, more conscious of where the votes are, and treats the economic-intellectual elites as a minor pestilence. This translates into easy demonising of all critics. This government, empowered by numbers of the faithful, then disdainfully ignores the “westernised”, “anti-Hindu” courts and their judgements. If you are looking for a counter in politics, you will be disappointed. There is a bipartisan consensus on this. See, while the BJP and its ideological fellow-travellers have been vocal on their criticism of Sabarimala and Diwali firecracker orders, the Congress has been quiet. Its contradictions show now and then, as in Rahul Gandhi saying that on Sabarimala, his personal view is that women of all ages should be allowed in, but his party’s view is different. This must be the only issue on which his party can dare to “disagree” with him. The problem is, he is too modern and bashful to own up his party’s view, and too much of a politician to shove his liberal conviction down the party’s throat. Because, after all, so many Hindu voters, in Kerala and elsewhere, are resentful of what they see as the courts’ and the state’s selective interference in their faith and temples. On triple talaq, he or his party wouldn’t take an unequivocally liberal position while the BJP does. This hypocrisy is utterly ‘secular’ on both sides. The Congress, as other “secular” mainstream parties (we don’t count the Left as mainstream), has similarly been quiet on Diwali firecrackers and muted on the reading down of Section 377 of the IPC. They know where their voters are, mostly among “kanwaria classes”; these orders, in the foreseeable future, will only be met with a combination of resentment and bemusement. You can of course take the message of reform to them, as you might with the Swachh Bharat Mission. But then, will this get you votes? And are you social reformers or politicians? If faith and spirituality are an unresolvable conundrum for this latter “them”, nationalism is another. It gives you delicious ironies like Mahatma Gandhi’s grandson rising in protest against Virat Kohli for admonishing a fan. Or more seriously, some court orders being defied and some being followed even after they were withdrawn. Check out the silence of all parties on that national anthem-in-cinema halls judgement, which was later withdrawn. Theatres still have not dared to stop playing it, because a vast, vast majority doesn’t complain. What is the problem with standing for less than a minute for your national anthem? The logic then stretches from issues like cow slaughter to Naxalism. After its initial response sympathising with the alleged Maoist sympathisers arrested by the Maharashtra Police, most mainstream opposition has fallen silent. Narendra Modi now goes to Bastar and calls the Congress a sympathiser of “Urban Naxals”. But the Congress doesn’t know how to respond. If it says that people can believe in any ideology, even work for a revolution as long as they do not pick up arms, the “kanwaria” multitudes will dump it. If it reminds the voters of Chhattisgarh, where its entire leadership in the state was wiped out by Naxal terrorists, and that its prime minister Dr Manmohan Singh had called armed Maoism the greatest internal security threat to India, it will annoy the intellectual, ruling elite’s commentariat, whose support it covets. Further, how does it then explain Raj Babbar calling them “krantikari” (revolutionaries) just last week, or Digvijaya Singh breaking the momentum of P. Chidambaram’s drive against them earlier? This group is now much noisier, having learnt to use social media. But it has also become more distant if not isolated from where real power lies – mainstream politics. And for a liberal democracy under intense pressure today, that isn’t good news. Also read: Three economists went around India asking: do you call yourself middle class? The BJP sees them as enemies, and the Congress looks at them as a liability. They, in turn, see the BJP as a democratic abomination and Modi as the new Hitler without a moustache. The Congress for them, is a confused, compromised, Diet Hindu party, with its leader visiting temples, desperately flaunting his janeu and devotion to his favourite deity. The Left is finished except in one distant state. That’s why they are being driven to an eroding island of English media, Twitter, and of course, their Halloween parties. Some attended these last month dressed as Modi, some as Rahul, some as Somalian pirates with faces painted black, one, famously as “Greater Noida”. All for clean fun at a civilised festival with no noise or nuisance. A new Halloween trend, I am told, was also to arrive dressed as Rafale. None that I know of pretended to be a kanwaria. So infra dig, no? There is a Marathi proverb:” Sarashi tethe Parsi” (No offence to the Parsi community). It means : ‘Parsis will be always with the winner.’ This is also one of the important characteristics of the Halloween class. No matter what his considered viewpoint is, he is constrained to bow to the political bosses, who without exception cater to the wishes of Kawanriyas. Tomorrow if Rahul Gandhi becomes PM, the Halloweens will be constrained to celebrate the occasion, no matter what their real views are. Same would be true, if Modi retain power. Power flows from the street, but not governance ability. If the new ruling party is short of talent, it could poach, as it has with politicians. It could empower mandarins, bring in experts as advisers or consultants. Speak in Hindi rather than in English at the highest echelons, be traditional in dress and diet, not apologetic about religious observances in public, but no compromise with excellence and academic ability. Don’t make a virtue out of mediocrity or plain incompetence. If the only form of validation is winning an election, that should not be jeopardised by failing so spectacularly to deliver.